Mini split air conditioner is also known as split units. There are basically 2 casings that are mounted one at the indoor and the other at the outdoor. 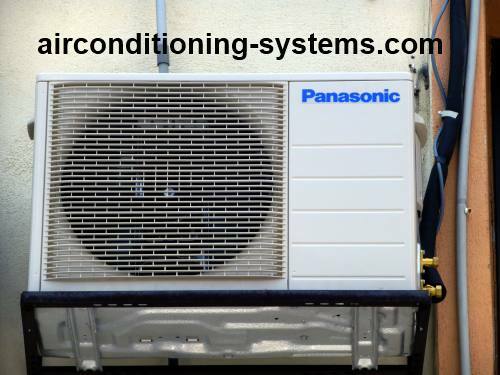 Compared to the window units, it is less noisy as the outdoor unit is mounted outside of the building or house with piping connecting the two units. Evaporator Coil is where the heat exchange is done with the room. It consists of fins and tubes. Control Panel is where user control the functions of the air conditioner. Displays at the panel may indicate the mode of operation, timer, on/off status, fan speed and other special functions. Most newer units have remote control feature built into the system. Air Filter is located in front of the evaporator coil to trap any dust or particles before going into the evaporator. This is usually washable and re-useable. Users are advised to clean it at least once in 3 months or more regularly if the environment is dirty. A LG indoor wall mounted unit in a mini split system. Other type of indoor units such as ceiling expose FCU, Ceiling Concealed FCU and Ceiling Cassette FCU are also used. Supply and Return Air Grills are where the air enters and discharge from the indoor unit. Fan Blower together with its motor are used to control the fan speed of the unit. High, Medium, Low and Ultra Low Speeds are usually designed for users to select. Capillary Tube is used as an expansion device where the flow of the refrigerant depends on the tube internal diameter, shape and its length. This tube is usually used in smaller units. Larger units use themostatic expansion valve which has a controlling valve to control in greater precision the flow of the refrigerant. Compressor is the main component of the system and is used to compress the refrigerant. Condenser Coil is used to reject heat from the refrigerant to the outside air. Condenser Fan is used in air-cooled condenser to help move the air molecules over the surface of the condensing coil, hence rejecting the heat from the indoor to the space outside the building. Condenser Motor is located here. The motor usually has two to three speeds. Smaller unit may only have 1 speed of control and turns on/off simultaneously with the compressor. During installation, it is always a good idea to keep the distance between the indoor and outdoor units as close as possible. Back to back installation is the best. As the distance increase, the pressure drop in the suction and liquid lines also increases resulting in the reduction of the unit capacity. 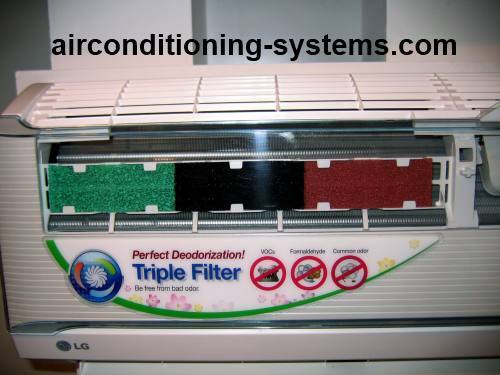 Compared to window air conditioner, this unit is quieter as the compressor is located at the outdoor unit. This is one of the main advantage of mini split air conditioner compared to window air conditioner. In the effort to make the unit even less noisy, some manufacturers placed the capillary tube at the outdoor unit to reduce the hissing noise of the refrigerant at the outlet end of the capillary tube. See also the steps to take when installing mini split units. If you are looking for unit which can be used as heating as well as cooling, mini split heat pump unit is a unit that is able to cool the room during summer and heat the room during winter. A 4-Way-Valve is used to accomplish this. During heating operation, it reverses the flow of the refrigerant which results in the evaporator to act as a condenser and the condenser as evaporator.